I finally got outside to take these pictures on my lunch break. 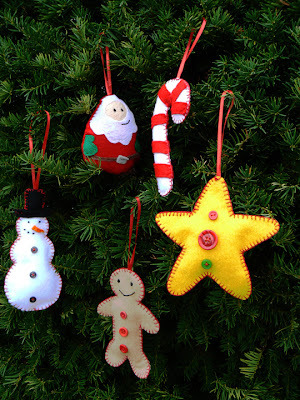 Classic felt Christmas Tree Ornaments. I hope you love them! The star is my favorite :) I think I'm going to re-take the group picture when there's better lighting- I already played with the image on the computer, but I think I just need to start over. These will be entered in the holiday contest at Softies Central, and will be in our Etsy shop eventually- probably after Thanksgiving. I took pictures of Nathan's newest plushie, so that should show up here soon. I'm also almost done with a new one (a chipmonk!!) which I'm excited to show you! Check back soon! Santa is my favorite. His expression is something other than jolly. I have to agree with Jennifer. I love Santa's crooked grin! Very nice ornaments. Didn't know you you could do such a nice blanket stitch!